Now that we are just weeks away from our last mortgage payment, I am amazed at the telephone calls we’ve been inundated with lately. It seems that we are prime targets for greedy banks “generously” offering us all kinds of special deals. In recent months, I've received calls from various institutions asking what THEY can do for US. How can we improve our service to your banking plan? Yesterday was the kicker though. It’s not enough they call at THE MOST inconvenient time, now I am getting follow-up calls on their solicitation calls. Automated phone messages asking me to evaluate my coerced conversation with their sales person. Not only do I NOT have time at dinner to take the first unprompted call, but they must be daft to think I am going to waste even more time answering some idiotic survey on how perfectly their personnel interrupted my quickly-cooling meal. How would you describe our last invasion of your privacy? How would you describe the tenacity of our personnel? How would you rate our “special” offers? Very ironic, now that I HAVE money, I don’t need you! How would you rate the length of the previous call? Congratulations on your upcoming Last Mortgage Payment! That's HUGE. Yes, congtrats on the last mortgage payment! Things like these are why I can NOT imagine life without caller ID. I mean, I know the universe existed without it in the past, but when I hear about people who don't have it BY CHOICE, I'm flabbergasted. I have to be in a seriously gracious mood to answer a call that has a phone number I don't recognize come up on the caller ID! Awesome on being almost mortgage-free --- whoootttt!!! I just never answer the phone at dinner. I let the machine take the call. I've been known to hang up on telemarketers too. Great going, Maureen! After being in the financial industry for over 25 years, you are a rare breed. That is, to have your mortgage paid off is rare. It is exciting news for a bank! They assume your credit is next to excellent and they would like you to apply for a home equity loan now. You have something they want.... your home as security on a loan! It's a good idea if you plan to use the money wisely. I've seen people use the money for frivilous things (in my opinion), like, vacations, and "toys". But, it's all legal and ok. Anyway, good for you on paying off the mortgage! Great job! Oh I love your survey, too funny! LOL! Your survey is awesome. I spent a half hour on the phone last night with my ISP who wasn't able to help me at all - and quite frankly didn't try very hard either. Then at the end he had the nerve to ask me if I would be willing to take a survey regarding that support call! I told him I didn't think that was a good idea for his sake. Very funny! Me and my roommate actually unplugged our landline; we both exclusively use our mobiles so we knew that EVERY time that stupid thing rang it was solicitor. If you register on a do not call list does that include your own bank that I guess somewhat has a right to call you since you are a customer? I wonder. I suppose I'll see you in two weeks or so, with Scotty in tow! Wow, you have nearly paid off your mortgage? That's amazing. It must feel so good. I hat those phonecalls, especially the ones where it's not even a person but a robot. Wow...how awesome to have your last payment on the horizon! I don't know many ppl who can say that! Good gracious! Obnoxious, isn't it? I'm always amazed by how many offers we get in the mail to refinance ours. I'm *sure* they have a deal for my money. :P LOL Way to go on paying your mortgage off!! You are the only person I know of who HAS money right now. Lucky! They can't find Osama Bin Laden and they can't project the cost of fuel more than 30 days in advance, but there are at least 40 financial institutions that know my credit rating and my home address. Sometimes a good credit score is the worst thing to have if you are trying to lay low. Ugh i hate those bill calls and telemarketers. We too, like others commented before me, refuse to answer the phone if either a) the caller's name doesn't appear on the Caller ID display, or b) we don't recognize the number. 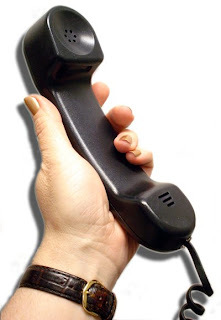 Sometimes it works, most times we just get our phone ringing off the wall... stupid telemarketers! I'm starting to answer the phone, just to yell "Put this number on your Do-Not-Call List and DON'T BOTHER ME AGAIN!"!!! I know... I'm getting crotchety in my old age! LOL! I had to move my blog. I hope you'll come and see me. Love, Nora. Jill: Thanks. We've never had caller ID. With a teenager in the house, who'd have thought the phone would EVER be for me? Oh yeah, only when it's telemarketers! Aw, Darla, thanks! I take it you work for a bank? Then I hope you took my ribbing with the humour it was intended. Cori: I just wish I could really use it one day! Jeff: Ha Ha! That is great. I wonder what the guy thought of THAT response. I am surprised he asked you to take it right away, in my experience, it's usually an automated call afterward. Hey Ashley! I read that most Europeans also have been deleting their land lines. I can see them being a thing of the past one day. And yes! Just a week until you are finally back! Can't wait to see you all again!!! Jo: Thanks! Yup, just a month and a half left... I can't wait! Thanks Sarah! I wonder if we'll do a mortgagae burning party... hmmm, something to think about! Momo: Well, once we have no mortgage, I can begin paying off everything else (or buy a new car) so I doubt I really ever have no payments on something! And daughter is graduating Grade 12 next year, so school tuitions will be next! Lotus07: Hah! Maybe they need to do a credit check on terrorists... then let the banks hunt them down! (they CAN be deadly, you know). Phoenix5: Hah! I think we are just fed up getting so MANY calls; we never had this problem years ago. Oh, thank you Nora!!! You are too sweet. I shall be over right away! That survey was hysterical! I keep getting phone calls for people who don't even live in my house. Very frustrating. hehe. I wish they had survey's like that once in a while. Love those!!! AND yay on the last mortgage payment!!! That has to be the most freeing feeling ever! I hope to experience it someday!! Bravo on coming close the end of your mortgage! What an amazing accomplishment!! I cannot believe the banks are so viciously trying to keep you indebted...it's beyond sad because so many people aren't nearly as strong and smart as you are. Susiewearsthepants: Thanks! Yeah, I would say 90% of phone calls are somewhat irritating. DJ: Thank you... hope yours goes smoothly. I have to say, we really lucked out whenever it came time to renew; we never had the high rates some of our friends fell into. Ann(ie): Thank you! I hope you do too. I'm already thinking a winter trip this year to celebrate (never done that before). Ha! This was GREAT! And so fitting that they call when you are about to be free from banks. Which deserve a big congrats! I think you should do one of those surveys just to give them all negative remarks and see if it helps some other poor soul.